Inspired by millennia of artistic legacy, the new Designo MX Series sports an elegant, award-winning sundial design and edge-to-edge frameless AH-IPS A+ panel with a 178-degree ultra-wide viewing angle that delivers incredible Full HD visuals in style. Built-in ASUS SonicMaster Technology, co-developed with Bang & Olufsen ICEpower makes for an incredibly immersive premium audio experience that ensures what you hear is true to the source. MX Series are ideal for side-by-side multi-monitor setup thanks to its ultra-narrow bezel for a more complete image. Featuring dual HDMI ports, connect multiple devices at once without having to switch between ports. 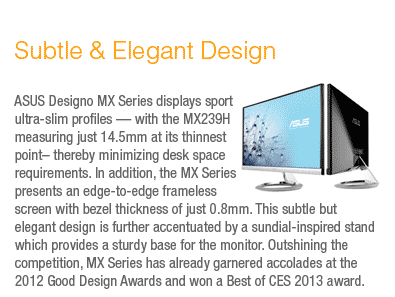 ASUS Designo MX Series displays sport ultra-slim profiles â€” with the MX239H measuring just 14.5mm at its thinnest pointâ€“ thereby minimizing desk space requirements. In addition, the MX Series presents an edge-to-edge frameless screen with bezel thickness of just 0.8mm. This subtle but elegant design is further accentuated by a sundial-inspired stand which provides a sturdy base for the monitor. Outshining the competition, MX Series has already garnered accolades at the 2012 Good Design Awards and won a Best of CES 2013 award. The MX239H monitor feature a 16:9 aspect ratio, LED-backlit AH-IPS A+ panel with a 178-degree wide-view angle that minimizes color shift on both horizontal and vertical planes for high-quality visuals from almost any direction. 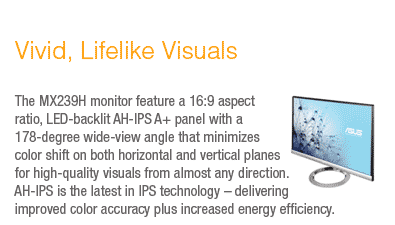 AH-IPS is the latest in IPS technology â€“ delivering improved color accuracy plus increased energy efficiency. The Designo MX239H features ASUS SonicMaster technology â€“ which was co-developed by the ASUS Golden Ear team and Bang & Olufsen ICEpower. The MX Series features up to 32mm diameter speakers for greater and smoother sound impact with better bass performance. It also offers a large resonance chamber, expanding monitor sound range to new extremes. A built-in amplifier powers speaker sound reproduction, just like a car engine with more horsepower powers a car for better performance. 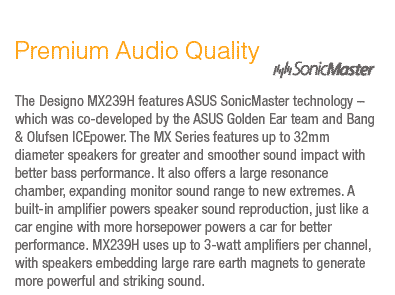 MX239H uses up to 3-watt amplifiers per channel, with speakers embedding large rare earth magnets to generate more powerful and striking sound. 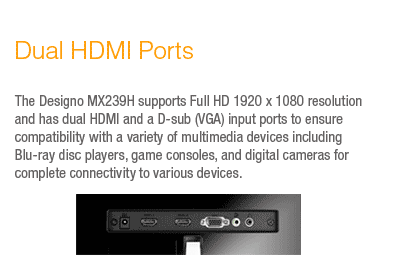 The Designo MX239H supports Full HD 1920 x 1080 resolution and has dual HDMI and a D-sub (VGA) input ports to ensure compatibility with a variety of multimedia devices including Blu-ray disc players, game consoles, and digital cameras for complete connectivity to various devices. 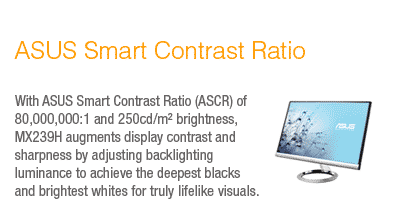 With ASUS Smart Contrast Ratio (ASCR) of 80,000,000:1 and 250cd/mÂ² brightness, MX239H augments display contrast and sharpness by adjusting backlighting luminance to achieve the deepest blacks and brightest whites for truly lifelike visuals. ASUS includes its exclusive QuickFit Virtual Scale feature with the MX239H, allowing you to preview photos and documents on-screen in their actual size prior to printing. It can be activated via a monitor hotkey, and serves as a highly useful guide to accurately view and edit photos in their native size. 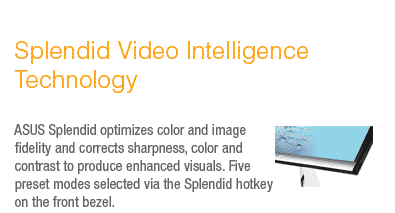 ASUS Splendid optimizes color and image fidelity and corrects sharpness, color and contrast to produce enhanced visuals. Five preset modes selected via the Splendid hotkey on the front bezel. 2013 ASUS Computer International. All Rights Reserved. ASUS is a registered trademark of ASUSTeK Computer. All specifications are subject to change without notice and features are only in select models. Products may not be available in all markets. Brand and product names mentioned are trademarks of their respective companies. 80,000,000:1 ASUS Smart Contrast Ratio dynamically enhances the display's contrast to delivering lifelike images. 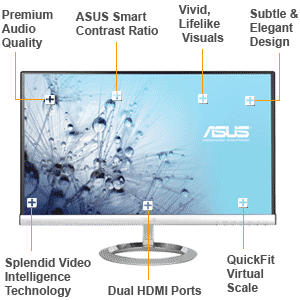 Top Level Categories for ASUS MX239H 23" Full HD 1920x1080 IPS HDMI DVI VGA Frameless Monitor.